The narrow footprint (16″x16″) minimizes the amount of counter-space required for your POS System. The deep under-till storage compartment can hold an tremendous amount of coin rolls and media. 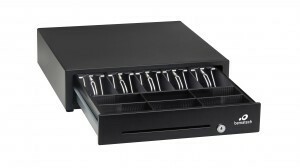 With steel ball-bearing slides and a durable powder coat finish you can feel the quality of this top-of-the-line cash drawer.